Based on the success and commendations of the award-winning initial phase of “daylighting” of the Saw Mill River in the center of its downtown, the City of Yonkers is continuing to return the Saw Mill River to its natural state by “daylighting” another section of the river to further the social and economic benefits experienced from the initial phase. The project was located on a now vacant series of parcels adjacent to a City-owned right-of-way that had fallen under neglect and remained under utilized for many years. The existing river that bisected the site had been channelized and covered over by buildings long ago. 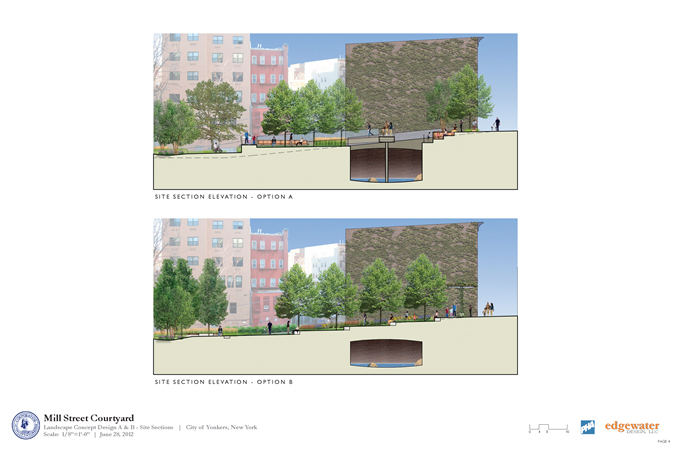 The project objectives required the “daylighting” and reconstruction of the existing river channel and creation of an urban park to maximize the use of public space with no disturbance to the surrounding buildings and infrastructure. To design the river channel, PS&S provided 3-D scanning technology to develop a three-dimensional model of the sub-surface river channel. This model provided exact cross sections of the channel at key locations needed to evaluate the hydraulic capacity of the existing channel. Utilizing this data, PS&S evaluated the existing sub-surface river channel hydraulics by modeling river flows using HEC-RAS design software. Model output was used to develop channel geometry, channel wall heights and drainage connection elevations. Reconstruction of the channel allowed the opportunity to provide drainage infrastructure to collect stormwater that previously discharged to the combined sewer system to reduce combined sewer overflow (CSO).